The Sweet Potato ocarina was first created in the 1850's and was made of clay. Truly special and unique, these beautiful wooden instruments from Charlie Hind possess a musical and artistic charm all their own. Get One Now! You have arrived at the personal website and online shop of ocarina craftsman Charlie Hind, who has been making fine wind instruments for over 40 years. These ocarinas have been chosen for solo work by renowned musicians, bands, and symphony orchestras because of their superior intonation and tone quality. Known for their exquisite workmanship and uniquely beautiful sound, Hind ocarinas are played by musicians all around the world. What is an ocarina? What's so special about a sweet potato? And what do they sound like? 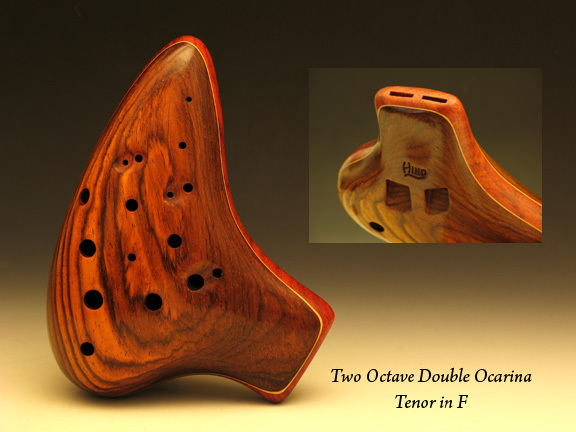 Charlie Hind's high-quality family of inline ocarinas are a great introduction to the exciting world of ocarina music! Learn all about the benefits and joys of owning your very own ocarina, and find out how to get the most out of it.